Anemone coronaria are one of the most loved flowers for bouquets and cut flower arrangements. 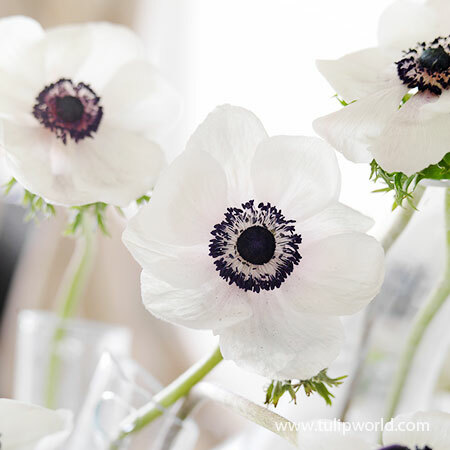 Black Eyed Beauty is an exceptional white anemone with smokey black centers and anthers that provide a dramatic appearance. Anemone bulbs have a hard outer shell that benefit from soaking in water 4-6 hours prior to planting. Once planted you can expect to see blooms from your anemone bulbs in approximately 3 months. If you stagger the planting times for your anemone bulbs this can help to extend the bloom period.